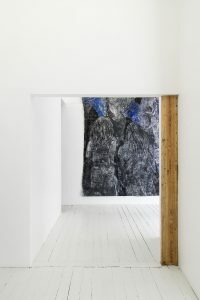 Idun Baltzersen, Face, 2018 (Woodcut on fabric, collage, 350 x 270 cm). 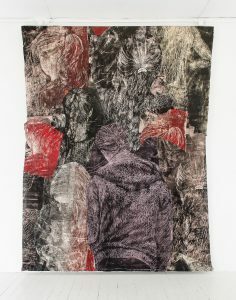 Idun Baltzersen, Stranger II, 2018 (Woodcut on fabric, collage, 300 x 230 cm). Idun Baltzersen, Crab, 2018 (Painted wood relief, 230 x 175 x 160 cm). 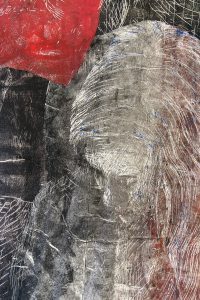 Idun Baltzersen, Face (detail), 2018 (Woodcut on fabric, collage, 350 x 270 cm). 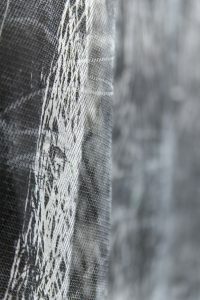 Idun Baltzersen, Stranger II (detail), 2018 (Woodcut on fabric, collage, 300 x 230 cm). 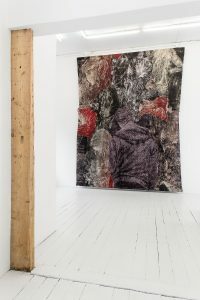 As the final exhibition of 2018 before Winter break, Nevven is proud to present Mask a solo exhibition by the Stockholm—based Norwegian artist Idun Baltzersen, featuring a new selection of her signature style monumental textiles and sculptures. Baltzersen’s work is characterised by an intimate yet size—wise intimidating depiction of defiant yet elusive young women, dressed in hooded sweaters, with braided hair and Converse shoes and carved out from dark, deep, backgrounds. These female characters, often faceless or portrayed from the back, become part of huge textile collages, in which their portraits are sawn together in surreal and beautifully daunting human landscapes. These young women are together yet also alone, insecure as much as protagonists, magnified and monumentalised by the artist, in an attempt to temporarily subvert society’s power roles. Baltzersen carves her characters into huge plywood boards, in a process that is an agonising and physically demanding confrontation with a material that inevitably resists the hand. Every work is therefore the result of a dialogue and somehow a compromise with the surface, a welcomed struggle for control where the artist embraces the physical resistance of the material as an essential part of the process. Both the carved boards and the resulting prints on fabric, bear all the traces of this painstakingly complex process. 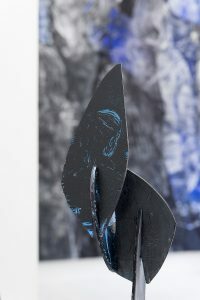 Every cut in the surface has a different energy and depth and together they compose figurative images that, if seen from close up, become abstract wooden landscapes made of thousands of small traces. These boards, after being used as printing plates, are also often exhibited individually or cut and re—assembled as sculptures. 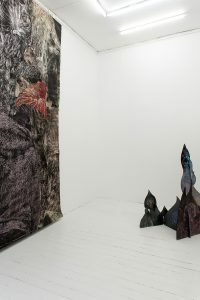 In Mask, Idun Baltzersen presents a new body of work created appositely for the exhibition and resulting in an immersive installation featuring two monumental textile collages and a sculpture. 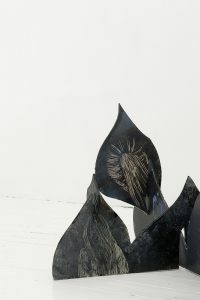 The colour black, which has characterised her past production and its dark atmospheres, leaves some more space to colours. We see blues, reds and pinks appearing from within the cuts in the wooden boards composing her sculpture. 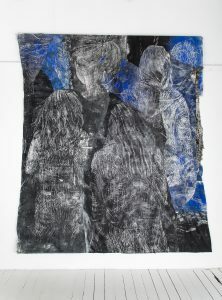 And again, these colours are used, in a darker shade, in the textured backgrounds of her textile works; from which the figures emerge from the seams and the overlapping fabrics. 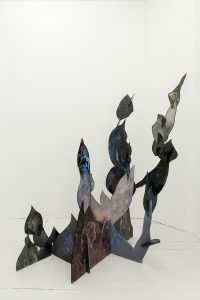 Mask is a unique occasion to literally step in and lose oneself into the dark yet magnetic universe that Idun Baltzersen carves out from wood and populate with women. An homage to female power, presence and body, today and in history, incarnated in women martyrs, heroes or just brave young girls going through life.